Gilgit Baltistan group issues direct appeal for relief due to fears that the bulk of the international aid money coming into Pakistan will be diverted to other regions. 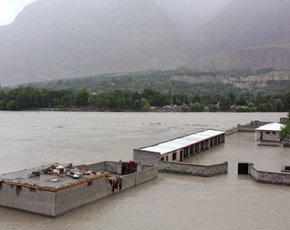 The secular Awami National Party (ANP) led Government of Khyber Pakhtunkwa and the nationalist organizations of Balochistan and Gilgit-Baltistan have issued separate appeals to the international community for assisting them to meet the tremendous loss of lives and economic damages suffered by them due to the current floods in Pakistan. Their direct appeals to the international community were triggered off by their fears that the bulk of the assistance amounting to US $ 800 million pledged by the international community at the special session of the UN General Assembly on August 19,2010, would be utilized by the Pakistan Government to assist the flood victims in Punjab and Sindh to the detriment of the people of Khyber Pakhtunkwa, Balochistan and Gilgit-Baltistan. There are already indications of discrimination against the people of Balochistan and Gilgit-Baltistan. While the Federal Government in Islamabad has been liberally issuing visas to volunteers of Western humanitarian relief organizations to do flood relief work in Punjab, Sindh and Khyber Pakhtunwa, severe restrictions have been imposed on the issue of visas to foreign relief workers wanting to work in Balochistan and Gilgit- Baltistan. The presence of a large number of foreign relief workers on the ground will ensure that an independent estimate of the damages suffered by the people and the assistance required by them will reach Western Governments and audiences so that they can ensure that the needs of these areas are not ignored by the Federal Government. In the absence of independent foreign humanitarian workers in Balochistan and Gilgit-Baltistan, the international community will not be able to correctly assess their requirements and assist them. While there is some understanding in the international community of the need to monitor the utilization of the aid being given to ensure that all the affected areas get their due share, no proper mechanism has been laid down for this purpose. The Western preoccupation has been on three pre-requisites. Firstly, to ensure that there is no corruption in the handling of the aid amounts. Secondly, to prevent the flow of any part of the assistance into the coffers of the terrorist organizations. And, thirdly, to pay adequate attention to the needs of Khyber Pakhtunkwa and the Federally-Administered Tribal Areas (FATA), which constitute the Pashtun belt, in the hope of thereby weaning the local people away from Al Qaeda and the Afghan and Pakistani Talibans. Aware of the interest of the West in assisting the affected people of the Pashtun belt, the Federal Government has so far not imposed any curbs on foreign humanitarian workers enjoying the confidence of their Governments going to these areas. Taking advantage of the interest of the West in assisting the Pashtun victims, the Government of the province has directly contacted the representatives of the Western Governments and non-governmental organizations and sought relief and reconstruction assistance worth US $ three billion. The affected people of Balochistan and Gilgit-Baltistan find themselves ignored by the international community. The Western non-governmental workers have been kept away from these areas by the Federal Government. Since the Balochs and the people of Gilgit- Baltistan, who are largely Shias, have kept away from Al Qaeda and its affiliates, their plight has not evoked much interest in the international community. In a direct appeal to the international community, Mr.Abdul Hamid Khan of the Balawaristan National Front of Gilgit-Baltistan has stated as follows: “ 52 people have died and 160 rendered homeless in the village Qamrah of occupied Gilgit Baltistan region, and 22 have died, 40 rendered homeless in village Talas, 45 died and 70 injured in Giyes of Diamar. Similarly, in Talas 22 people were killed and 40 houses destroyed while in Hotoo, Rondu, Darel, Tangir, Botogah, Khinar, Thor, Hoodoor,Babusar, Gini, Hunza Nagir, Chhamoogardh Colony of Konodas and Skarkooi, Gilgit, Ghowadi Baltistan, Yasen, Gulaper, Isshqaman, Damas, Ginday, Sandhi, Hondoor, Dahrkoot, Mastuj, Booni, Garam Chashma, Yarkhoon in Chitral, and Koli and Pattan in Kohistan over 500 people have lost their lives whereas, more than half a million have become homeless and nearly 50,000 families have completely lost everything, including land, shelter, livestock and all means of living". The Army, which maintains an iron hold over Balochistan despite the supposed presence of an elected Government there, has seen to it that Balochistan would not be a beneficiary of the assistance funds and that the real extent of the damages in Balochistan would not be known to the outside world. It thus wants to punish the Balochs for waging their freedom struggle.